Looking for a last-minute break in Desenzano? Check availability from more than 120 hotels and apartments of all standards. No reservation fees. 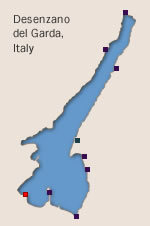 Desenzano del Garda is located on the southern shore of Lake Garda to the west of Sirmione. It has excellent road connections to the Milan-Venice motorway (therefore, as well, to the north-south route from Austria down to Verona) as well as having its own railway station. Those heading to Desenzano from the east or west are advised to use the A4/E70 motorway which stretches from Venice to Milan. The exit for Desenzano del Garda is just to the south of the town and it is only a short drive across the railway line into the main centre and to the lake shore. Drivers coming from the north and south generally should head for Verona on the motorway connections where there is a connection to the E70. Hiring a car for your vacation in Desenzano? Lowest price guarantee from major car rental suppliers with no hidden costs. Rent from the airport or in resort. At the southern end of Lake Garda, Desenzano has easy access to a range of major airports in northern Italy, as well as some smaller ones which are served by the cheaper air travel operators and travel companies. The towns in brackets are the closest well-known destinations to the airport. The largest and most likely to have convenient scheduled flights from further afield are Venice (Marco Polo) Airport and the two airports at Milan - most visitors would choose one of the first five airports from the point of view of surface travel convenience, however. Desenzano has its own railway station which is part of the main line between Verona and Milan with frequent services. From the station it is a long-ish walk or a short taxi ride to the lake shore and historic centre of the town.